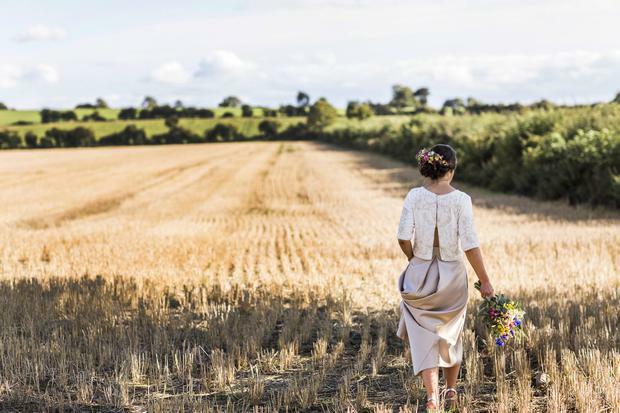 And while every bride (and groom) who graces the pages of THEVOW.ie is, in the words of Mary Poppins, practically perfect in every way on their big day (and every other day of the year!) there were some gúnas that really stood out over the last 12 months. In absolutely no particular order, THEVOW.ie editor Karen Birney picks her favourites from the year*. 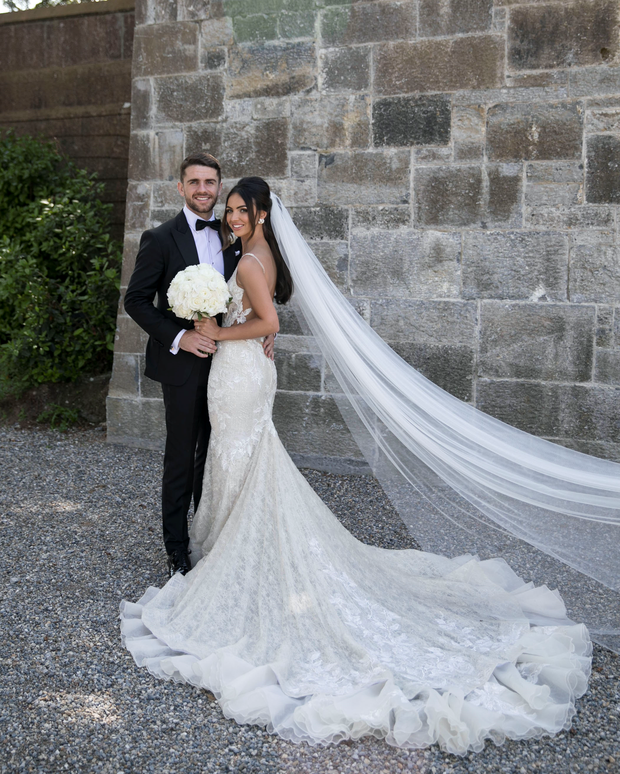 When Kerrie Harris married childhood sweetheart Robbie Brady in Adare Manor in June this year, there was no doubt we were in for a stylish day. The bride looked absolutely show-stopping in her glamorous lace gown, which she purchased while on a trip to London. The beautiful backless gown featured a plunging v-neck complete with sheer insert, semi-sheer boned bodice, a satin belted waist and full lace and ruffle tiered train, and suited her to a T.
One of our most swoon-worthy destinations weddings of the year saw bride Jasmine in the loveliest Liz Martinez gown which she found in The White Gallery in Newry. The gown was custom made in Paris, and Jasmine accessorised it with a headpiece by Luna Bea and had her veil custom-made to match. 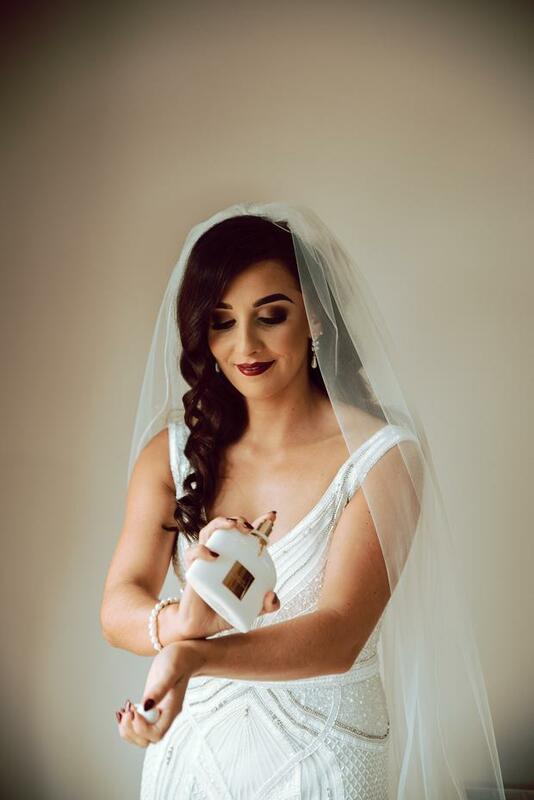 "I felt so incredibly lucky to get to wear something so beautiful and so special on my wedding day," Jasmine told THEVOW.ie. "I can’t recommend Rachel and the White Gallery enough. She has an amazing eye and is the exclusive stockist of all of the designers in her store. Every single gown was stunning. [My wedding dress] is currently hanging on the front of my wardrobe and I don’t think I’ll ever be able to part with it." As chief designer and owner of designer occasion and wedding dress hire boutique Covet in Dublin, one would have presumed Aleana would have known exactly what she wanted in a wedding dress from the get-go. However this wasn't the case: "To my surprise I actually needed more of traditional shape," Aleana told us, "so my goal was to mix a traditional shape that was light and had texture and this little number from Jesus Peiro hit the nail on the head with this metallic gold silver brocade fabric." In true Covet style Aleana had scoured the 'net to find the dress brand new and then altered it in-house. The best part for us? She added pockets and pleats. How cute! Her dress has been rented by other brides since she wore it and no doubt has brought them as much joy as it did her! Irish model Tia Duffy had an incredible 2018, but the highlight for us at THEVOW.ie? When she walked down the aisle in this stunning Essence of Australia strapless a-line gown. Her favourite part of the dress? It featured one of the biggest trends in bridal this year - pockets! (See more gorgeous gúnas with pockets in our style guide here). Without doubt one of our most stylish real weddings of the year saw We Are Islanders founder Deirdre Hynds tie the knot with her fiancé Pat McIntyre in the gorgeous Gloster House. She wore a dress by fellow We Are Islanders founder Rosie, using materials and techniques used throughout the label's own collections. The dress was made from Irish linen sourced in Derry. It used a process known as 'beetling', whereby the linen is hammered until it become almost rigid. "It almost stood up on its on when not being worn," Deirdre told us. Her turban was produced in Irish linen, and designed by award winning milliner Laura Kinsella. The style was Art Deco, and was Deirdre's nod to a veil, while still supporting Irish fashion and design. 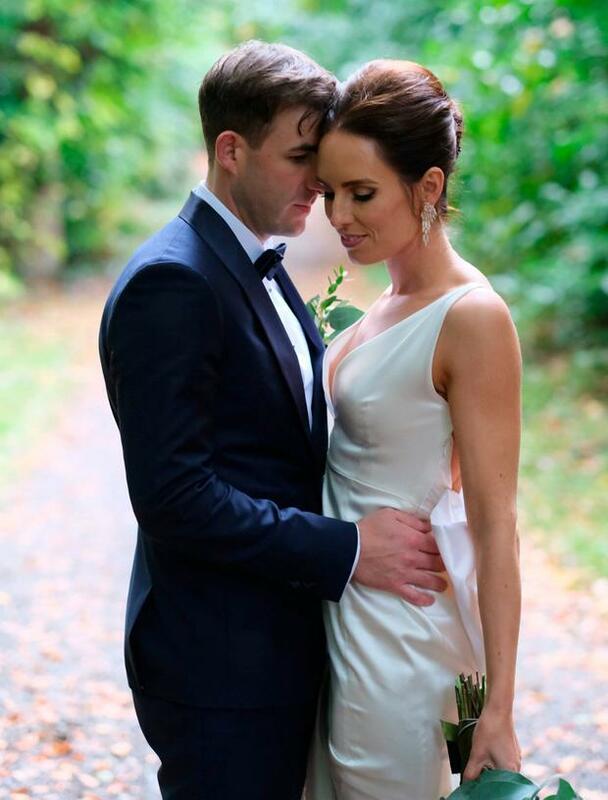 Ex Fair City star Aoibheann beamed in her custom made gown by Irish designer Dawn Fitzgerald when she tied the knot with Brian Farrell back in October. Aoibheann's gown featured a huge bow on the back, with a dreamy duchess satin detachable train, embellished with exquisite hand-beading and embroidery. 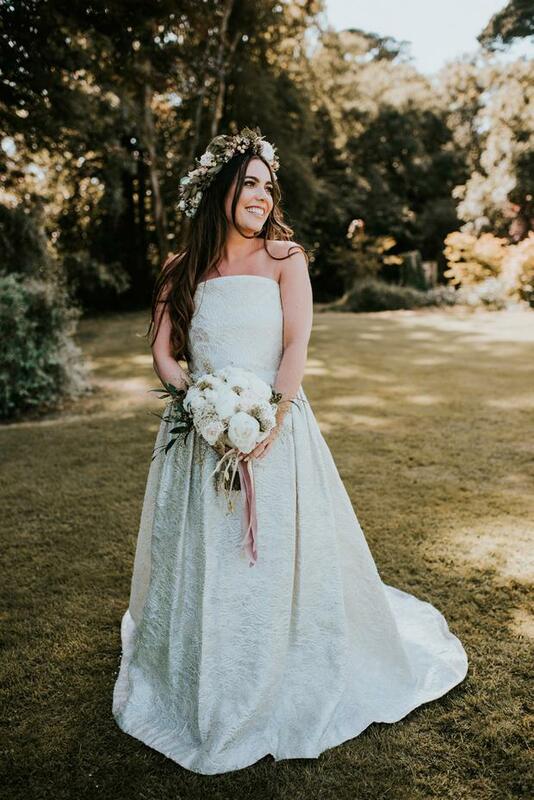 Our most recent bride on the list, gorgeous Danielle tied the knot with GAA star Cian O'Sullivan in December looking every inch the boho bride. A flattering mermaid silhouette with boned corset and dreamy lace train made a stylish statement on the day, while her husband looked equally stylish in velvet. If you're currently finding it difficult to pin down the perfect gúna for your own big day, you might take solace in the fact that Hannah tried on a total of 76 dresses before finding the one for her (her advice to others now is to "decide early the style the best suits your body, then stick with that and go with your gut")! She eventually found her beautiful Peter Langner gown in Browns Bride in London (but highlights Alice May Bridal in Dublin and Halfpenny London as two of her favourite boutiques). "My God can this man make dresses," Hannah said. "I happened to meet him when I was in the store and after getting a sense for the dresses I was pulling off the hangers he knew what dress I should wear. Although I didn't like it on the hanger, the second I put it on I fell madly in love with it." Okay so she might not be Irish but she tied the knot here rocking one of her own designs and looking super stylish in the process so we had to include Elizabeth! 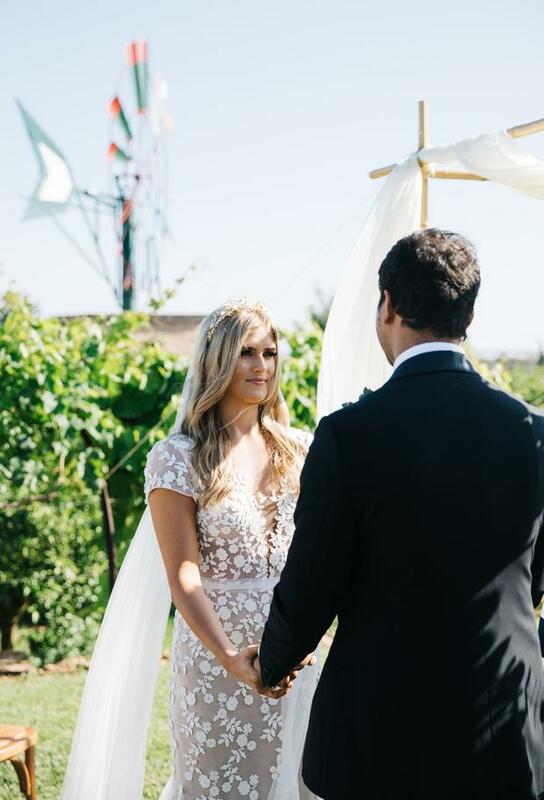 "I made my ceremony dress using silk crepe and lace from my mother’s wedding gown," she told THEVOW.ie, "it was such a special dress because I was able to repurpose the lace from the sleeves cuffs and train almost exactly like they were on my mother’s original dress. For the reception, I changed into a silk jumper with a beaded Chantilly lace. It had a tulle overskirt that I spun out of on the dancefloor!" Elizabeth also made the bridesmaids dresses, which were white and had the same beaded Chantilly lace as her jumper. To see more of her designs, visit elizabeth-leese.com. 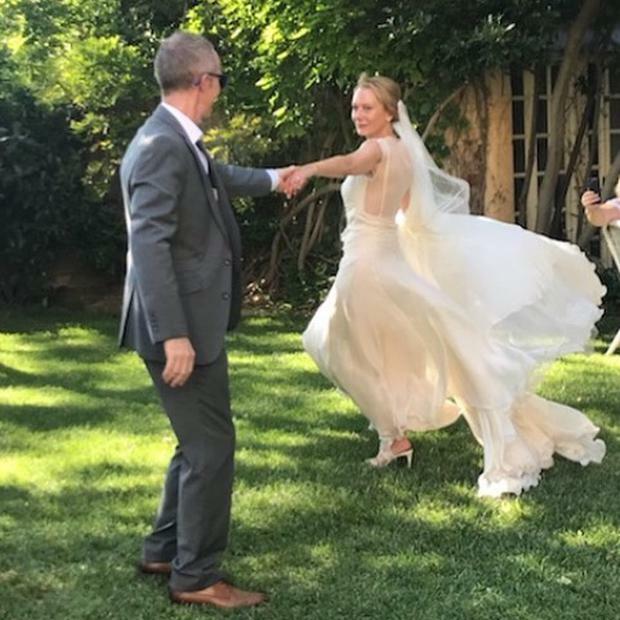 Red Rock star Cathy tied the knot with fiancé Brian Roe in France earlier this year, wearing a stunning creation by Peter O'Brien. Irish designer Peter, who was in attendance on the day, congratulated the bride and groom on Instagram, revealing that Cathy's floaty gown was made with 'a rather generous metrage of pearl coloured silk mousseline'. Dreamy! 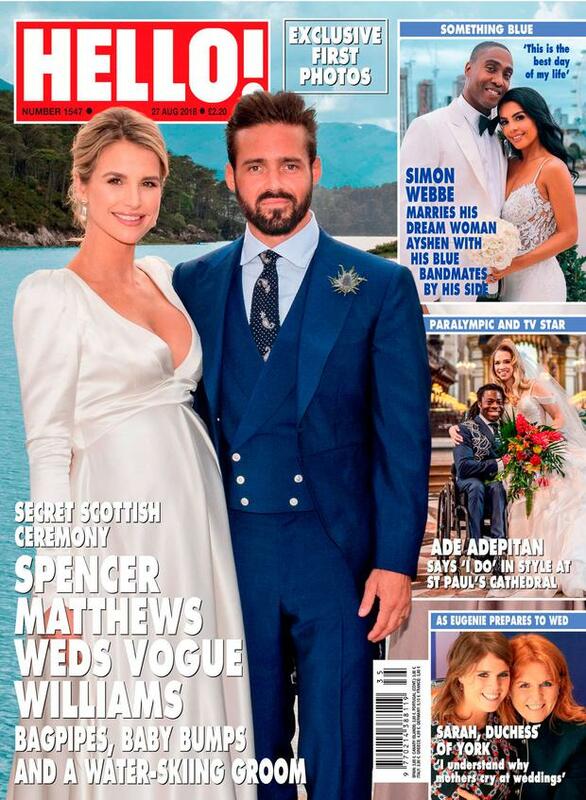 Irish designer Paul Costelloe had his work cut out when he opted to design a wedding dress for a Vogue Williams in just seven days. It was 'a full team effort' according to the designer, who created a stunning plunging silk satin gown for pregnant Vogue, who gave birth to her son Theo in September. "She was, as always, a joy to work with," Costelloe said of the former DJ. "She's a beautiful woman, a credit to her generation and to Ireland." 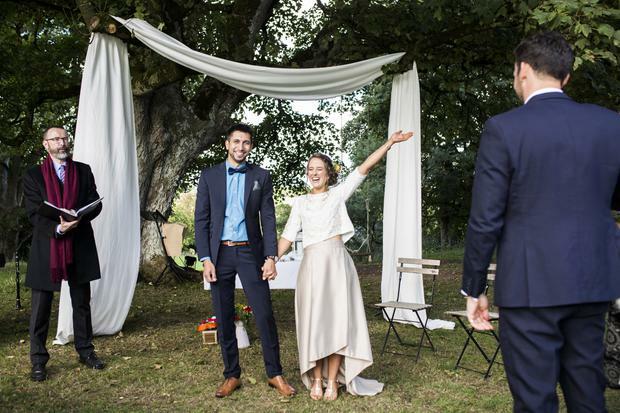 Stylist Judy Gilroy tied the knot this summer in a backyard wedding that looked straight off a Pinterest board. She beamed in a plunging gown by Israeli designer Inbal Dror featuring the prettiest petal applique and cute bow waist. 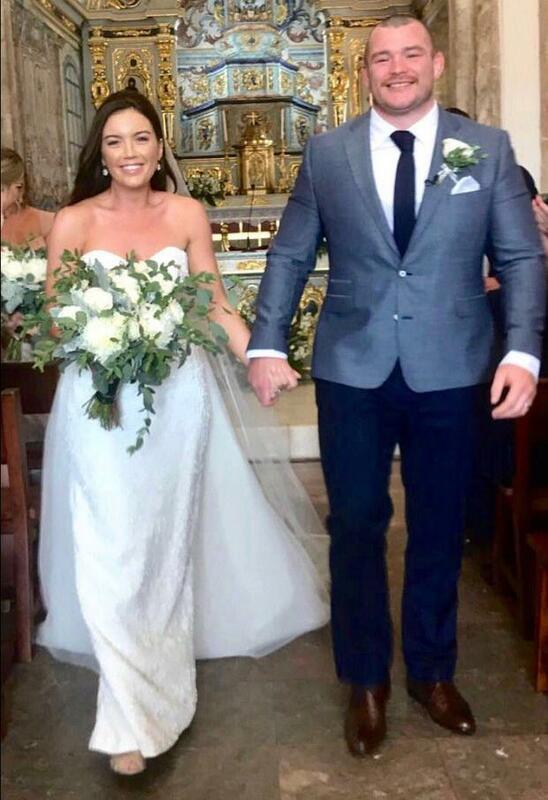 Radiographer Sinead married her Irish rugby playing fiancé Jack McGrath in a stunning cliff side ceremony at the Tivoli Hotel in the rustic seaside town of Carvoeiro in July this year, and looked incredible in a beautiful strapless floor-skimming brocade gown featuring a flattering sweetheart neckline and show-stopping detachable train. The white dress was the perfect option for the raven haired Sinead, and we just loved her minimal accessories and beautiful cream and green boquet. 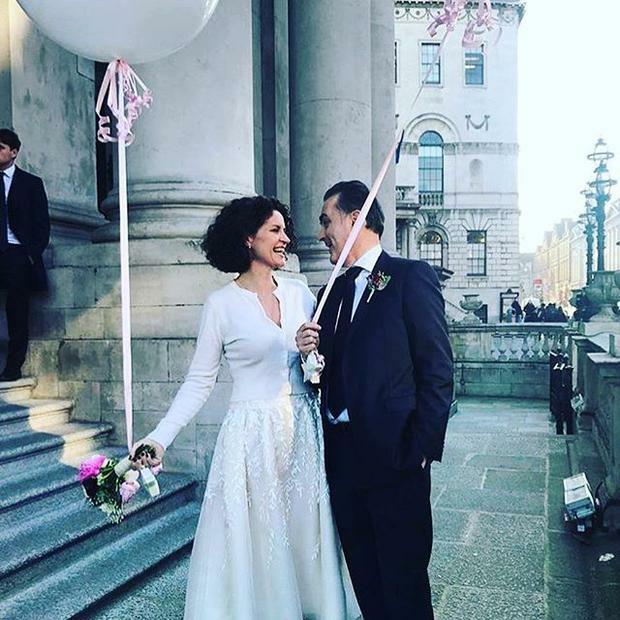 Helen Cody tied the knot in a fun and fabulous Dublin city wedding in March this year, looking as chic and stylish as we've come to expect from the renowned Irish designer. The bride walked up the aisle at Dublin City Hall with her two gorgeous terriers and wore a beautiful tea length skirt with a simple buttoned cardigan. Stylish bride Niamh was one of several brides in THEVOW.ie's real weddings this year who opted for a mix and match style from Irish label Folkster. "I knew I didn’t want to wear a conventional wedding dress so I had made an appointment with a vintage dress shop and planned a day out in town with my mam and bridesmaids" she told us. "When I tried on the outfit in Folkster I knew almost straight away that this was the outfit for me. I went home, slept on it, and headed back into town the following morning to buy it! It was elegant, unusual, comfortable and very me. My favourite features were the beading and embellishment on the top - and that the skirt had pockets!" Orla's fabulous fairytale frock was one of our most popular Instagrams this year - and you can probably see why. Orla bought her wedding dress was bought in Frilly Frocks in Drogheda after at first finding shopping for the dress 'a little overwhelming'. "I knew what I didn’t want but not quite what I wanted," she said, "I just knew how I wanted to feel. Frilly Frocks were amazing along with their alterations team to help me alter and customise the dress to the way I wanted." 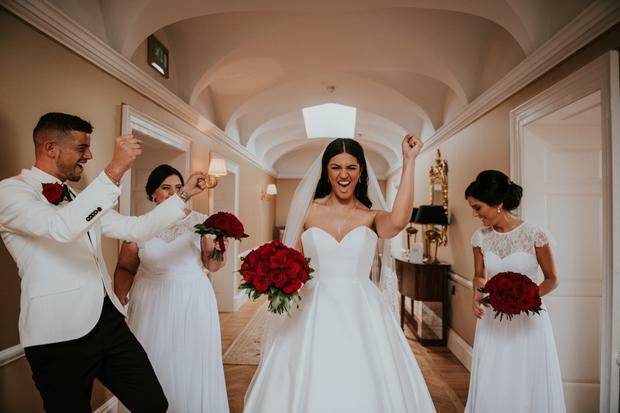 Top Irish blogger Rosie tied the knot with long-term love Paul Quinn in May this year, and held her reception in Carton House. She later revealed that she travelled to Barcelona intending to find her dress there, but returned home empty handed. She eventually found 'the one' - a skin-skimming lace mermaid style gown which she paired with a cathedral length veil and cascading bouquet - in Padanee Bridal in Carrick-on-Shannon. 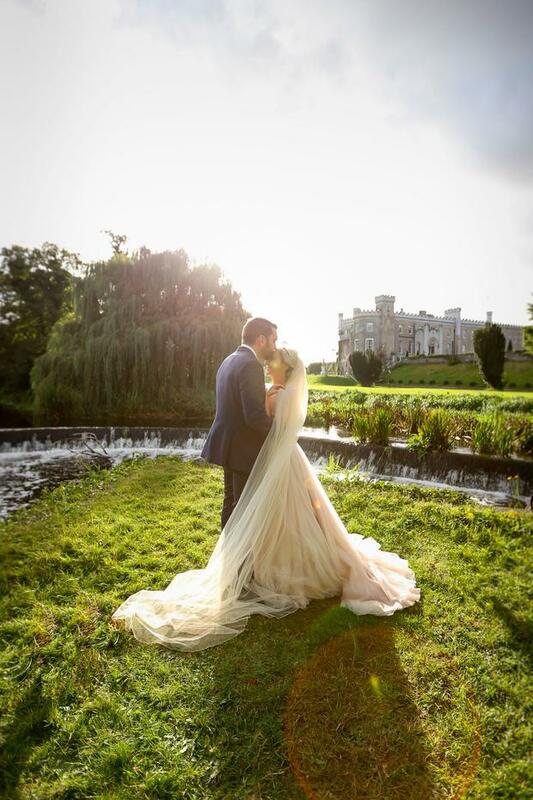 Tyrone bride Marie-Claire tied the knot with her long time love Dean McNally in Darver Castle, looking every inch the chic winter princess in a fabulous fitted gown by Eliza Jane Howell. Marie-Claire's gown was purchased in Creative Ideas Bridal Cookstown, Co. Tyrone. Shopping for the dress, she says, had its highs and lows, and while she enjoyed the time spent with her mother, mother-in-law and bridesmaids there were a few days of frustration when she thought she would never find the dress she wanted - "But I ended up finding my dream wedding dress in a bridal boutique ten minutes from where I live! It was all perfect and meant to be." 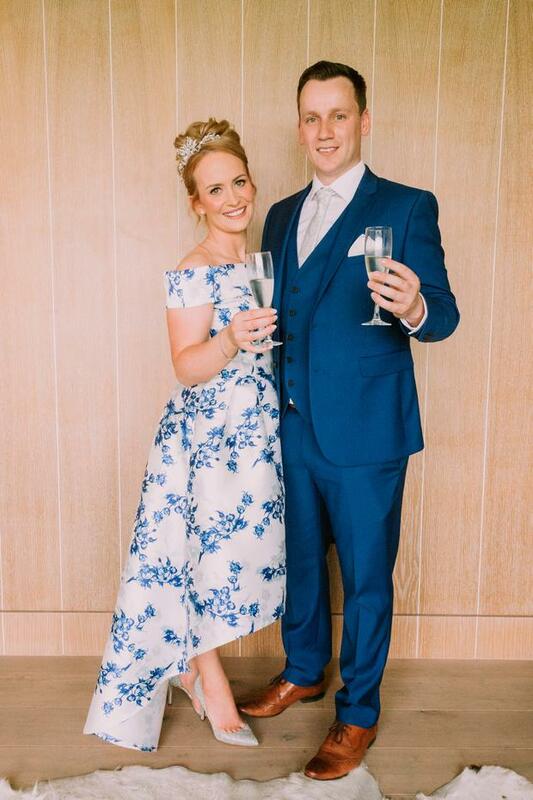 Another popular one on THEVOW.ie's Instagram feed, this stunning two-piece bride Caroline wore by Charlie Brear was purchased in Dublin bridal boutique The Suite. "I totally unexpectedly found it in the first bridal shop I had an appointment with in Drury Street" Caroline told THEVO. "I loved coming here for all my appointments, the staff were so wonderful and really just so accommodating. I visited two other bridal shops, but they just didn’t compare," Caroline changed her look for the evening's celebrations, wearing a Dawn Fitzgerald silk top for less restrictive dancing! And finally for something completely different (and a huge hit with our Facebook followers) - bride Anne in the prettiest blue and white number from Debenhams online. "It was delivered to my home and it was perfect!" Anne told us. Perfect indeed!